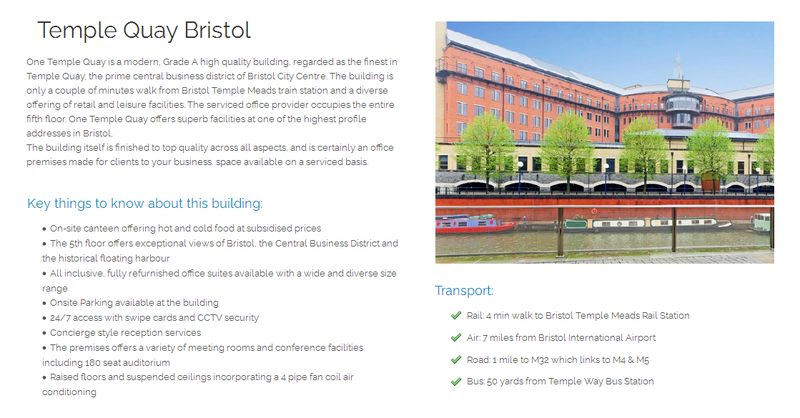 Yes, we have a No Deposit Office Space Option in Bristol! There is one business centre we are currently working with in the Bristol area who are happy to provide you with No Deposit terms. This flexible office provider is currently offering a No Deposit option on their office premises located not at Temple Quay, but at Temple Gate situated less than half a mile away still in BS1. Most Business Centres or landlords will not advertise their space with ‘No Deposit’ or ‘No up front’ terms., yet there are a number of serviced office providers who will and can offer No Deposit Licence agreements. For more information on the option that we can introduce you to in Bristol, and to arrange your viewing, please call us now or click the callback button above / complete the quick enquiry form below, and one of our consultants will get back to you just as soon as possible. NOTE: There are no fees for you to pay in connection with our services.